Companies/Contacts – Find company data on your device, using advanced filters set up in CRM. See a summary of your financial relationship with the client, as well as previous activity history. Manage Activities – Tasks, Notes, Meetings are all supported. You can add/edit/delete all of them (subject to individual user permissions setup). GPS-Sort – Sort company records based on their distance from your current location. Late meeting cancellation? Find leads near you with the flick of a switch. GPS-Stamp – Every interaction you make with mobile CRM is GPS Tracked, and this data is shared with your CRM database. So if you are noting down that you dropped off an item at a customer the note you create will have the GPS location embedded within it. Live Location Tracker – Your mobile devices can be set to continuously update your central CRM with their location, making it possible to create customised CRM functions based on this information (customisation required). For example, you might want to be able to find the nearest technician to a client who requires support, or see how far a salesman is away from a scheduled meeting. This is just the beginning – Our mobile CRM provides a powerful starting point – we’ll be enhancing this to include our full suite of CRM capabilities and if your business requires customised solutions that either use the mobile data in the office, or out on the device talk to us about how we can help. Our first version will work on Android, iPhone and Blackberry devices. Please log a ticket with [email protected] with the email subject “Mobile CRM” and we will schedule you in as soon as possible. If you are interested in a pre-release version , please indicate this in your ticket and we will see if we can get a version installed for you sooner. Every licenced user of your Tall Emu CRM is allowed to use Tall Emu Mobile CRM – it’s that simple! 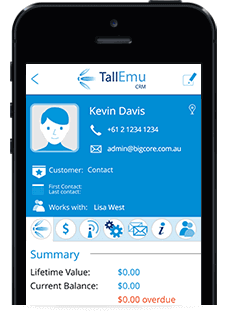 If you want to give people mobile CRM access, all they need is a Tall Emu CRM licence. If you are on a managed support agreement, we will schedule a time to connect to your server and install the necessary connectors. You may need to ask your IT provider to make some network adjustments, but you won’t see a bill from us. If you do not have a managed support agreement, we charges a flat fee of $600+GST fee to install it for you. * Must have a valid subscription to Tall Emu CRM, or, have current Software Assurance status. Installation charges for needed software may apply.